There's a whole new batch of the places people fantasize about skiing off to in December. COURCHEVEL, France (MainStreet) -- They're the places most people fantasize about around December -- some well-known ski destinations steeped in glamour and luxury, others less familiar winter wonderlands (including a fresh batch of design hotels hoping to become this season's "it" spot). Regardless of which, they are all part of a jet-set vocabulary that seems to change every winter with bragger's rights for those managing to ski their slopes first or stay at the newest hotel. For those who like a good dose of paparazzi in their winter escapes, there's no ski scene quite like Courchevel. The slopeside yin to St. Tropez's yang, the French ski town is divided by altitudes, with 1850 being preferred by fashionable visitors such as LVMH's Bernard Arnault, Roman Abramovich and Dasha Zhukova. Despite new properties in the past years including Les Airelles, Cheval Blanc remains the top hotel in town (and perhaps all of France) with its eatery by three-star Michelin Chef Yannick Alleno and in-house boutiques by Dior and Louis Vuitton -- none of which seems a coincidence considering the hotel is also owned by LVMH. Fans of the Virgin Limited Edition properties will enjoy its lesser-known The Lodge in Verbier in the Valais region of southwestern Switzerland. New for this year is Le Strato, a daring and visually stunning luxury design hotel created by a founder of French ski brand Rossignol. 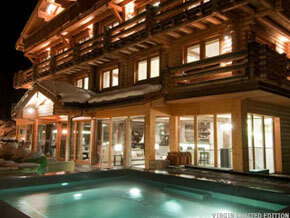 The property is in Courchevel 1850 with a ski-in/ski-out address near the base of the Cospillot lift. Inside, a quintessential chalet contains a mix of contemporary decor with antique pieces and artwork selected by designers Pierre Dubois and Aime Cecil, and its 25 rooms -- in a palette of leather-upholstered walls, arched wooden windows and always-prominent pieces of baroque art -- are the hottest of the season. Perks such as a kitchen led by two-star Michelin Chef Jean-Andre Charial of L'Oustau de Baumaniere add to the allure of a property that's also home to an in-house ski boutique with champagne bar and on-demand staff of world-champion skiers that can take you down the mountain's hidden trails and still make it back in time for apres-ski. Italy's Dolomites have long been a top ski destination, and Milanese fashion designers and a Venetian elite still descend on Cristallo Hotel and Spa in Cortina d'Ampezzo with its storybook facade draped in a blanket of fluffy white come mid-December. Inside there's a gilded lobby of old-world Italian architectural details from 1901 now infused with Gustavian decor, as well as two gourmet eateries and a home-style Italian "stube" cooking up local recipes and traditional cuisine. Post-slope ouches are consoled in the bi-level Cristallo Ultimate Spa with its indoor pool, hammam and menu of "After Ski" massages. While most American ski resorts like to tuck in early, the Italians burn the midnight oil amid the red-lacquered walls and velvet VIP booths (a throwback to Italy's jet-set '60s) of the Monkey bar and nightclub during winter high season. In St. Moritz, there's no shortage of historic luxury hotels, from Badrutt's Palace with its wintertime Nobu eatery to the Carlton with its imperial Russian glamour. It's here in nearby Chamfer you'll find legendary two-star restaurant Johri's Talvo and this month's opening of Hotel Giardino Mountain -- clearly aiming to be one of the top design hotels in the region. The 78-room hotel mixes elements of traditional Alpine design with more modern decor and technology than other area five-star properties, but without compromising luxury. Giardino will be home to two eateries, opening Friday, as well as a stylish bar and more casual cafe. An on-site spa will include body and facial procedures with products from Aveda and Dipiu as well as an indoor pool built to wow. In Verbier, fans of Virgin Atlantic and its Virgin Limited Edition properties, including the Caribbean's Necker Island and Kasbah Tamadot in Morocco, can find the lesser-known The Lodge in Verbier in the Valais region of southwestern Switzerland. Long a haunt of European stars and U.K. royalty, Verbier is enjoying a building spree that will include a 2013 installment of Starwood's W Hotel and Residences -- the collection's first-ever mountain retreat. Until then, Sir Richard Branson offers his own palatial ski chalet on a per-room or wholly booked basis. The property comes with a staff of 13 (and Bam Bam, the chalet's dog) that has all the gourmet cooking, luxury spa treatment and housekeeping angles covered. The style mixes rustic wood paneling with a sophisticated decor and endless party accoutrement, from an on-site cocktail bar and billiards room to choice of an indoor pool or outdoor whirlpool deck that's Switzerland's ultimate ski pad.